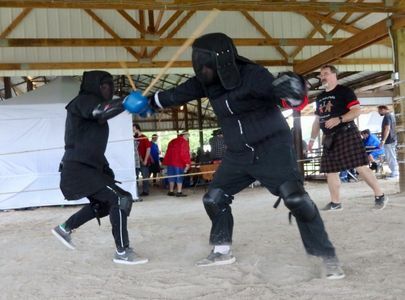 Designed to help both men and women experience the visceral joy of donning a mask and wielding a sword, we offer a wide variety of sword fighting classes for your continued interest and study. Sessions include both class instruction and Baer Open Sparring Sessions (BOSS). Walk-ins are welcome and no registration or equipment is required; however, if you’re new, please plan to arrive 15 minutes ahead of scheduled class time to ensure your class paperwork is complete—we don’t want you to miss one minute of fun! Two-Handed weapons are the largest of the hand-held weapons and have been popularized throughout history. Two-Handed weapons were far more suited to battlefield combat. These larger weapons were a force to be reckoned with on the battlefield but were costly to make. However, the power that these weapons offered, both physically and psychologically, was well worth the cost of making them. 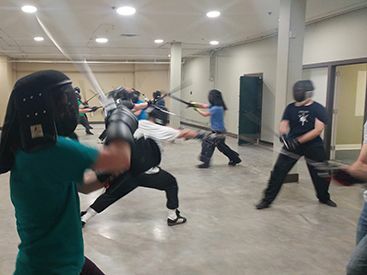 The two-handed weapons used in our sword fighting classes will vary and include long sword, staff, and spear. Grappling with and without weapons is also covered at regular intervals in the two-handed weapons classes Weapons: Long sword, spear, staff, grappling, and sword grappling. This is no choreographed class. This is real, adult combat fighting and training with competition rule sets. Designed to get you in a place mentally and physically to compete in light saber competitions (if you want to go that direction) or to simply beat your opponent with grace and elegance. 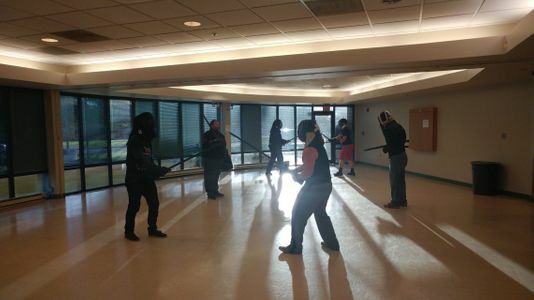 Using custom and generic competition grade light sabers, the principles of light saber combat are taught through drills and then practiced for cohesion. 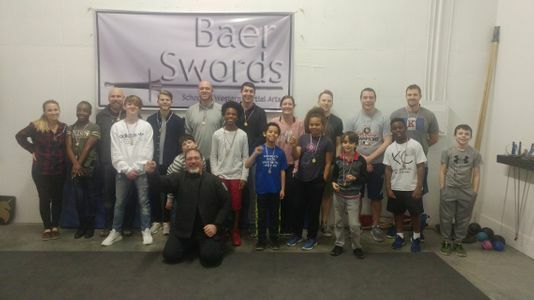 (Baerswords Open Sparring Session) One hour open sparring sessions for our arts students to utilize the skills they have learned with others in the same skill range using the weapon(s) of their choice. During these sessions, there is no formal instruction and they can choose who and how long they fight during the one hour time frame. Every Monday from 6:00 – 7:00 PM!